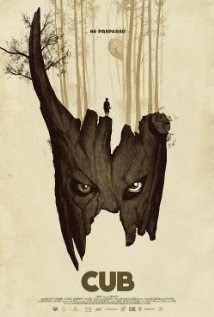 Synopsis: A cub scout group encounters a violent, feral boy living in the woods. Everyone knows when a group of kids go camping in a film, chaos will ensue. There's always a murderous entity lurking beyond the trees ready to torture and kill the group at a moment's notice. Director Jonas Govaerts is known for his short films, but here he takes a chance on the classic terror in the woods with his first feature with marginally successful results. Sam (Luijten) is a troubled boy who is a beacon for bullies within his scout group. He's not very confident, over imaginative, and always seems to be in the wrong place at the wrong time. Before his group leaves for their annual camping trip, the two leaders, Chris and Peter, warn the boys of Kai, a feral boy lurking in the woods killing people at will. Of course, most know this is just a campfire tale, but as Sam is quick to learn, Kai is real. The first half of the film plays well, as the characters are being established and the mystery surrounding Kai is slowly revealed. Unfortunately, the film loses traction the closer it gets to the climax. The film almost relies completely on Luijten's performance. Through other character's interactions and conversations, we begin to learn the history and sympathize with Sam's situation. Luijten has a quiet presence, but his performance is complex and is the highlight of the film. The other characters are equally fleshed out and dynamic making the characters the most interesting part of the film. However, as we see more of Kai and what his situation is, the anticipation of the climax of the film begins to build. However, the plot becomes convoluted during the last third where Kai's intentions seem to change on a dime, and the movie becomes a bit of a mess. It seems that the plot initially wanted us to learn more and feel sorry for Kai, but then forgot to flesh out that plot point. There were also aspects of a some great and creative horror elements used by the bad guys, such a fairly creative traps set in the woods, but those elements weren't used to their full potential. Govaerts has the potential to become a great genre filmmaker. He has a knack for creating fleshed out protagonists, but has trouble developing interesting antagonists. Individually, the horror elements are fun and creative, but they just didn't mesh well together in the end.